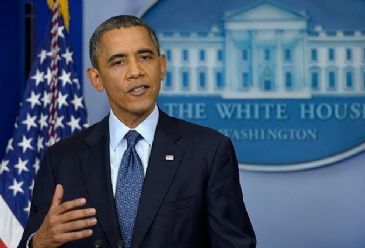 WASHINGTON – President Barack Obama requested new war powers from Congress Wednesday to combat the “grave threat” posed by ISIL. “If left unchecked, ISIL will pose a threat beyond the Middle East, including to the United States homeland,” Obama said in a letter to lawmakers accompanying the three-page draft legislation. The draft does not authorize the use of U.S. forces “in enduring offensive ground combat operations,” but leaves the door open for limited military engagements, such as rescue operations and special operations missions against ISIL’s leadership. Asked if the language in the draft was "fuzzy," White House press secretary Josh Earnest said that it was "intentionally so." "It's important that there aren't overly burdensome constraints that are placed on the commander-in-chief who needs the flexibility to be able to respond to contingencies that emerge in a chaotic military conflict like this," he told reporters. “Local forces, rather than U.S. military forces, should be deployed to conduct such operations,” he added. The administration has long-maintained that it is within its authority to act against the militants using a more than decade-old authorization passed to combat al-Qaeda following the Sept. 11, 2001 terrorist attacks on the U.S.
“Although my proposed AUMF does not address the 2001 AUMF, I remain committed to working with the Congress and the American people to refine, and ultimately repeal, the 2001 AUMF,” he wrote referring to the authorization for use of military force. As written, the draft authorization ends three years after it is enacted, or roughly around the time that Obama’s successor begins their term. But it has already stirred debate among predominantly Republican lawmakers who say that it does not go far enough. “Ultimately, our objective is to show the world that the United States is resolute in our commitment to destroy ISIL,” he said in a statement. Obama welcomed debate over the proposal's content. “I do not believe America's interests are served by endless war or by remaining on a perpetual war footing. As a nation, we need to ask the difficult and necessary questions about when, why and how we use military force,” the American president said during televised remarks.